We have an update on the number of infected computers. Today's calculation is a total of 8,976,038 infections worldwide and 353,495 unique IP addresses. That's a quite a big difference compared to our last number — there will be a follow up post coming soon to explain the methodology. 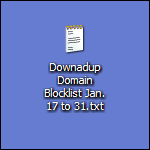 Our post last Monday provided a preemptive Downadup domain blocklist. A new list of potential domains for January 17th to the 31st is now available. Click the image below to view the list.